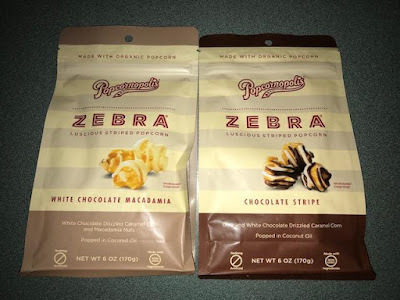 Mommy's Favorite Things: Zebra by Popcornopolis Review & GIVEAWAY! Zebra by Popcornopolis Review & GIVEAWAY! The Zebra line from Popcornopolis is perfect for your Holiday gatherings this year! It's a change from other not so tasty Holiday treats and looks beautiful in a bowl, so is perfect for Holiday gatherings as a centerpiece for snacking. Popcornopolis is Gluten Free, non-GMO made, made with USDA certified organic popcorn and popped in coconut oil. Every ingredient is free from artificial colors, flavors and preservatives. 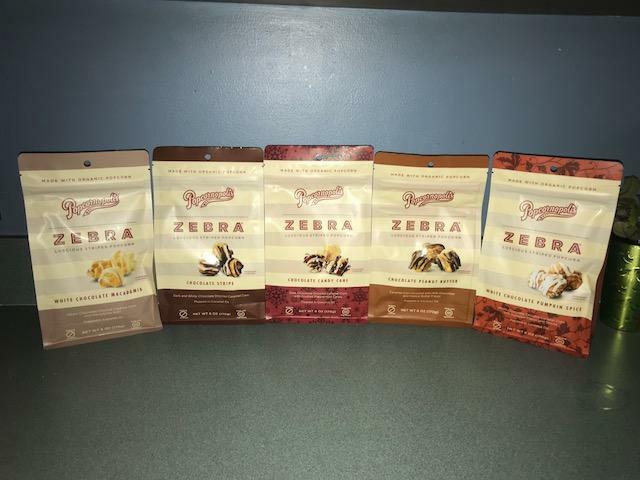 We enjoyed each flavor of the Zebra line by Popcornopolis, but my personal favorite flavor was the White Chocolate Macadamia for sure! Very creamy and decadent. I liked them all though, who am I kidding!!! My children's favorite was the classic Chocolate Stripe! Overall: ***** hands down!! Loved this popcorn! 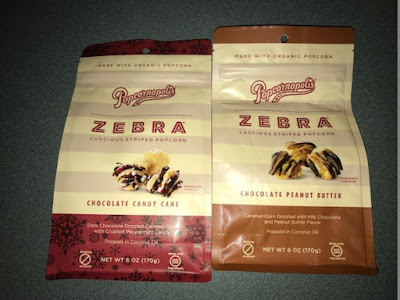 1 reader will win a Zebra by Popcornopolis set like I reviewed! I would like the Chocolate Stripe the most. I would really like to try the Chocolate Stripe. I would like to try Popcornopolis' Zebra White Chocolate Macadamia popcorn. I want to try the chocolate and peanut butter flavor. I think I'd like the Chocolate Peanut Butter flavor. I think I will like the chocolate peanut butter the best. I'd like Chocolate Peanut Butter best. Would Love to try the Chocolate Stripe!! I would enjoy the Chocolate Candy Cane flavor. I want to try the Chocolate Peanut Butter flavor, but all of them look so good! Which flavor do you think you'll like the most? The chocolate stripe looks tasty! They all look great, but my first choice is chocolate peanut butter. I would like to try the White Chocolate mAcademia nut the most. I think I'll like the Chocolate Peanut Butter the most but they all look good. I would like the Chocolate Stripe flavor. I would like the White Chocolate Macadamia. Thanks for the giveaway! I would like the chocolate peanut butter the most. Would love to try chocolate stripe! I think I'll like the White Chocolate Pumpkin Spice the best! I would like a chocolate stripe. I would like to try the chocolate striped flavor first. 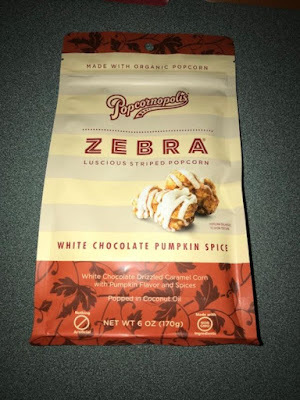 White Chocolate Pumpkin Spice sounds amazing! I think I would really love the Chocolate Stripe! I think I would like the white chocolate pumpkin flavor. The Chocolate Pumpkin Spice flavor would be wonderful to try. I think I would like the Chocolate Peppermint the most but want to try them all so I can be sure. The chocolate peanut butter is the variety I am most interested in. The Chocolate Peanut Butter sounds fantastic! I think I will like the Chocolate Candy Cane flavor from Popcornopolis the most. The Chocolate Peanut Butter sounds the best to me! I would like the choc peanut butter, sounds delicious. I think I would like the Chocolate Candy Cane flavor the most, but I already know the White Chocolate Macadamia is amazing! Thanks. Chocolate Peanut Butter will be the biggest hit here! I think I would enjoy the chocolate candy cane flavor. I would love to try the chocolate peanut butter one first! I would like the chocolate candy cane flavor the most. I think I will like the Chocolate Candy Cane the most. I think I would most like chocolate candy cane. I think I would like Chocolate Peanut Butter. I would love to try the white chocolate macadamia. I think I'll like Chocolate Peanut Butter the most. I want to try the White Chocolate Macadamia flavor.